You are at:Home»Demographic Data»National Data»County Level Analysis»Category: "Housing Data"
Housing costs have risen 19.4% since 2005 nationwide. Like most trends though, the data is different in every state. 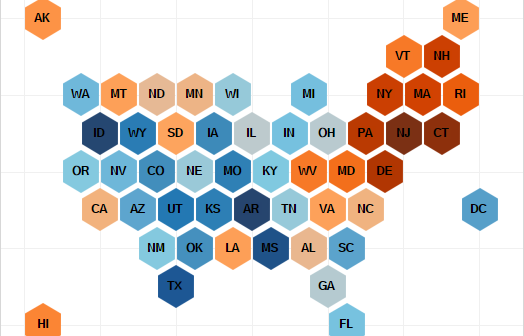 This visualization lets you see all the state trends in one spot. What is the Distribution of Household Size by State? A look at the distribution of household size for every state. How Many People are there per Household in the US? A look at how many people there are per household in the 133 million households that are in the United States. What States Have The Most Households With Only Wireless Phone Service? The CDC tracks home phone service and estimated that at the end of 2014, 45.4% of households only have Wireless phone service. These visualizations show the percentage by state. What is the Median Home Value and Cost of Rent In Each State? How Many People Live in Homes That They Own or Rent in Each State? What Percentage of Their Income Do People Spend on Rent in Each County?